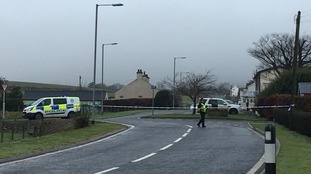 An investigation has been launched by police into the 'suspicious' death of a 52-year-old woman in Carrutherstown. Officers were called at 6.03am to a report of an injured man, who was found near to the village by a motorist on the A75 on Friday 22 December. When emergency services arrived another injured man was found nearby. Both casualties have been taken to Dumfries and Galloway Royal Infirmary. At that time a 52-year-old woman was pronounced dead in a nearby property. A 35-year-old man has since been detained in police custody in relation to the incident that took place in the property. Investigations are ongoing and officers remain at the scene. Police would like to reassure the public that they are not searching for any other suspects. Anyone with information should contact Loreburn Street Police Station on 101, quoting incident number 0552 of 22 December 2017.